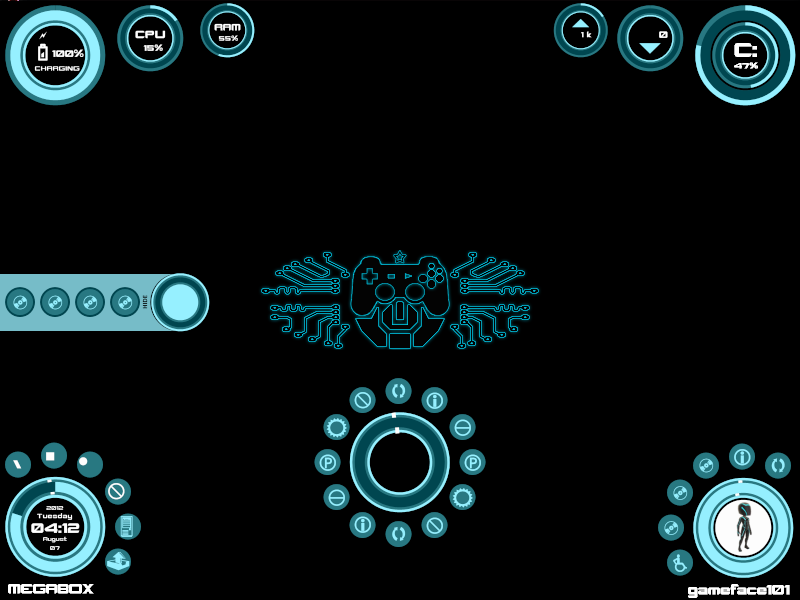 From trying to make RMXP RGSS scripts to designing many game HUDs... making a skin with Rainmeter was like second nature. I really like the combinations of style, easy navigation, and monitoring performance with simpler coding to setup your graphical gadgets interface that you can share for others to interact with their windows pc. GAME_GRID is my very first attempt towards learning Rainmeter and making an original TRON theme/skin. The user_disc is designed for the bottom-right corner. It displays your account's avatar and user name. Clicking on the avatar will toggle the additional user options. The system_disc is designed for the bottom-left corner. It displays your current time and date and computer name. Clicking on the time/date will toggle the additional system options. The root_disc is designed for the center of screen. Clicking on it's center will toggle the popular links. The POWER_DISC is designed for the top corners of the screen. It displays the battery life for portables. The hdd_discs ca be positioned anywhere on the screen. They display total amount used versus free space. Clicking on these discs will access the drive or will open the CD/DVD drive according to drive letter. 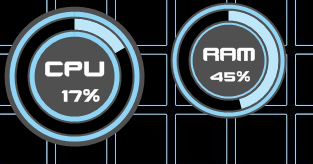 CPU & RAM discs monitor and display usage, clicking on these will take you to the task manager. NET IN & OUT discs will monitor upload and download activity. clicking on NET IN will take your to your downloads folder. Please do not post this skin on any other site. Feel free to share links to this public page. This skin is free to use yet you must give credit. Any edits must be shared here and not another site. The GAME_GRID project will be ongoing as there are future plans for other color themes, features, wallpapers, and more. Please recognize the time, effort, and energy by making a donation. 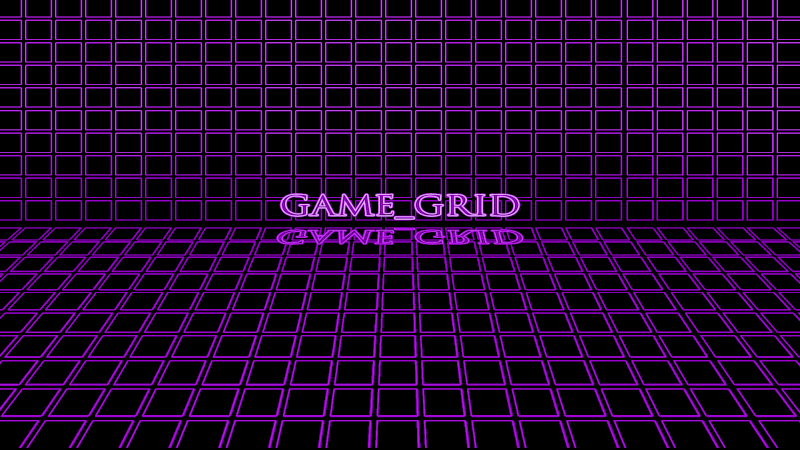 Make a donation and support the Game_Grid project today! i member messing with rain meter for a little bit qhen it was on my old computer. yea the syntax of the code is fairly easy to pic up. and its kinda fun making new themes. @blue as far as i know you can add just about anything you want. i think its java script, or lua. leaning more towards lua. Looks good Gameface. Hope it all works out fine. Is there a transparency option? so instead of changing each gadget one by one, you can change them all through the .inc file. kind of like css for html. so plenty of options by simply making edits using notepad. I really like the orange skin. I'm really impressed by your work. Keep it up! ^ thanks sno - I sent you the beta version of the skin for you to test before it gets released, kick it around and give me your feedback. Could this work for a background too? 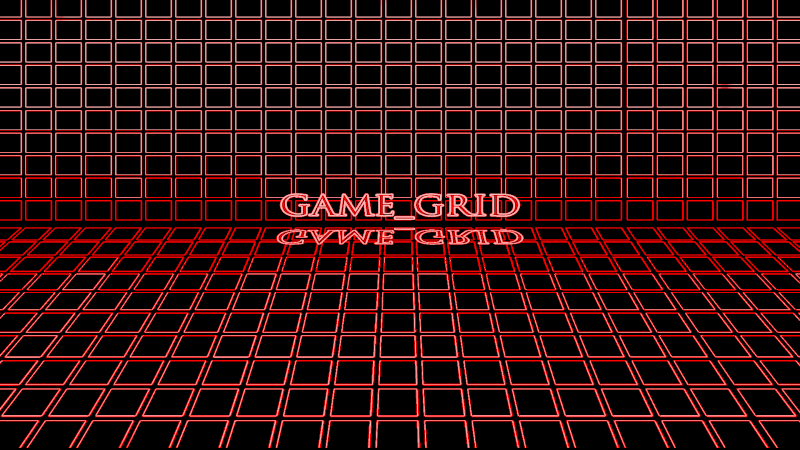 I've been using a tron-like g101 logo as the wallpaper throughout the development. Here's the latest look at what I'm about to release. Love to see the discs maybe be bigger/slightly transparent. 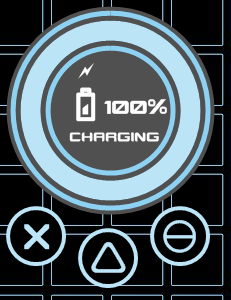 Love the extra features on every widget. Looking forward to the next patch!!! the show/hide/toggle slider is made to anchor on the left of the screen. You could make a shortcut to the forum. 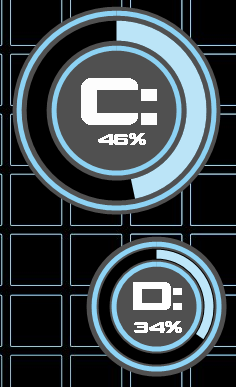 Is the slider supposed to be like a dock? Also how do I get the dude for the User Disc? MotionM wrote: how do I get the dude for the User Disc? try changing your profile pic, see if that does the trick. Awesome, Ill try to do that then. LOL Yeah, can't forget Stargate. new GAME_GRID version 2.1 added to Original Post. this skin is pure code and font, no images required. don't get too excited about this one, it was basically cleaning up the option links, this next one will finalize the remaining options and the style. lots of improvements to the style, performance, and functionality. Let me know if you need a certain size. there's now a new tab_disc on the right which toggles color themes!! control orange, gangster green, renegade white, and back to default... civilian teal. well I had some free time in between busy parts of my day and had a fever for more color themes! edit: original post has been updated. Hmm, not too sure on if I could do a recolor. I'll mess around with it and see what I can do. No problem. It's just another 45 minutes of my day. impressive! i def love the color selector! i enjoy the new link buttons and the custom wallpaper really ties in your theme!. combine some of the disks.. drivespace and upload download should be one disk. 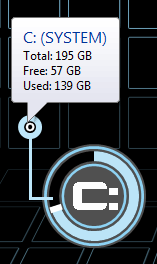 you dont need to know your drive space at all time. 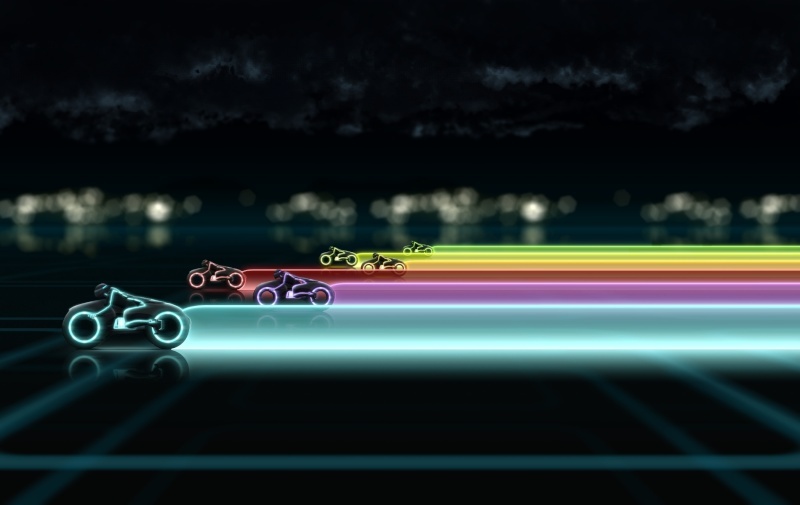 but maybe a good like heartbeat pulse like a light cycle..
perhaps some movements.. ive seen some themes with just animated things.. to add character. sounds i know theyre coming.. but i need to hear some cool sounds. 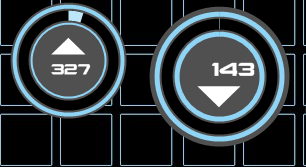 and some custom icons for the profile.. a Q or Tron or the uprising char..
last link in the disk on the left.. ITUNES? WINAMP? 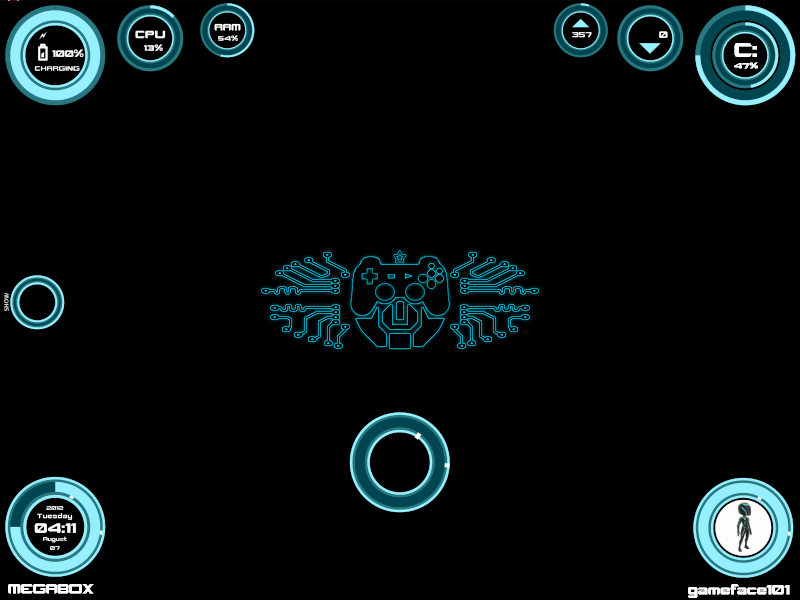 just some ideas.. i know how you like your interface.. everything upfront.. so im not gonna comment on the busy'ness of it .. Isn't there an option in most to change the wallpaper as well? Maybe associate the colors with the wallpapers as well. If you're going to do this, tell me what size you want the wallpapers and I'll resize them. There any plans for a dock as well? Is there a way to make the size smaller? There a certain size you want? It'll only take me a minute to do. has been uploaded, find the download link in the original post. trick out your PC's desktop! more features, advance tooltips, more click/tap commands, mini versions of the original discs and new tabs, more gadgets to setup your own custom disc interface, still pure script drawn. Updated my screens with the new Rainmeter skin looks great.